This article would show you how to remove iTunes DRM and convert DRM M4V to MP4 by M4VGear with detailed step-by-step text tutorial as well as video tutorial. Besides, the article also introduces the difference between M4V and MP4 formats, and discuss the benefits of converting M4V to MP4. What is M4V and MP4? & Why Convert iTunes M4V to MP4? M4V is a multimedia DRM-protected video format specifically designed for Apple products such as the iPhone, iTunes store, and iPod. Since m4v is deeply associated with Apple Inc., m4v files are more often than not protected by a copyright — Apple’s FairPlay DRM copyright protection. The MP4 is a container format, allowing a combination of audio, video, subtitles and still images to be held in the one single file. MP4 is much more universally recognized compared with M4V and it can be played using a variety of video players and hardware devices, like iTunes, iPods, iPhones, iPads, Android phones, Media Player Classic, VLC media player, PS4, Xbox, etc. 3: Why We Need to Convert M4V Videos to MP4? By using the FairPlay DRM decryption, these files with the .m4v file extension could only be played on authorized computers in iTunes. In other words, people are not allowed to copy and convert any iTunes movies even after they purchase it. Apparently, most people don't accept this kind of policy. So they are seeking ways to convert DRM protected M4V files to some more common used video formats like MP4, so that they can watch iTunes movies on almost all media players and any HD devices as they want. M4VGear is developed to solve this problem and help you get rid of DRM restrictions from iTunes videos, both Rentals and Purchases. M4VGear DRM Media Converter is the fastest DRM removal tool on markets. It can remove DRM from your iTunes movie at 20X faster speed and convert iTunes M4V video to unprotected MP4 format with 100% lossless quality on Mac OS and Windows. After removing DRM, you can keep iTunes rentals forever without worry of expiration. What's more, this powerful iTunes DRM removal tool can also retain subtitles and audio tracks. Thanks to the intuitive interface and self-explanatory options, we believe you can handle M4VGear DRM Media Converter at the first sight. With batch conversion support, you can save a lot of time by creating a batch list of M4V videos from iTunes' library, and convert them all to MP4. Tutorial: How to Convert DRM M4V to MP4 with M4VGear? 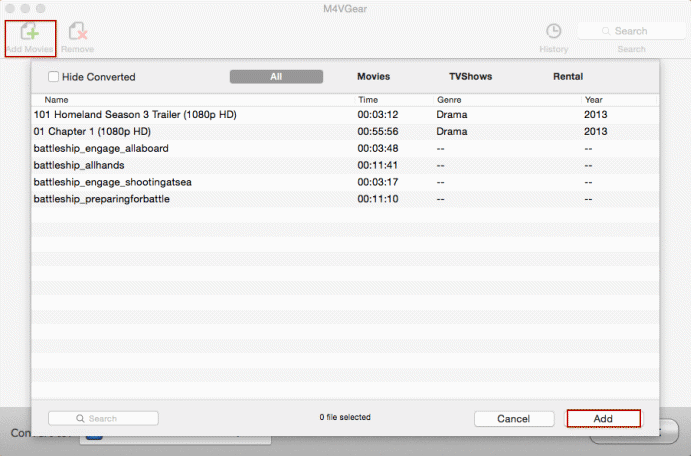 This guide takes the Mac version of M4VGear DRM Media Converter as an example. Windows version would perform in a similar way. After launching M4VGear for Mac, you can either click "Add Files" button to select the videos from iTunes library or add the iTunes videos by dragging and dropping them into the program. Note: M4VGear supports batch conversion, so that users could add as many files as they want. Before conversion, it's available to choose output formats as "Same as source for MP4"or "Customized MP4 video" from the button after "Convert to" . Output format as "Same as source for MP4" is highly recommended, which enables users convert at 20 times faster speed with Dolby 5.1 audio track preserved. Click "Convert" button to remove DRM and transfer iTunes M4V to MP4 format. Wait for a while till the conversion is done. You can find the well-converted files by clicking the "History" button and then copy and transfer the non-protected iTunes movies or TV shows to any portable devices for watching whenever you want. 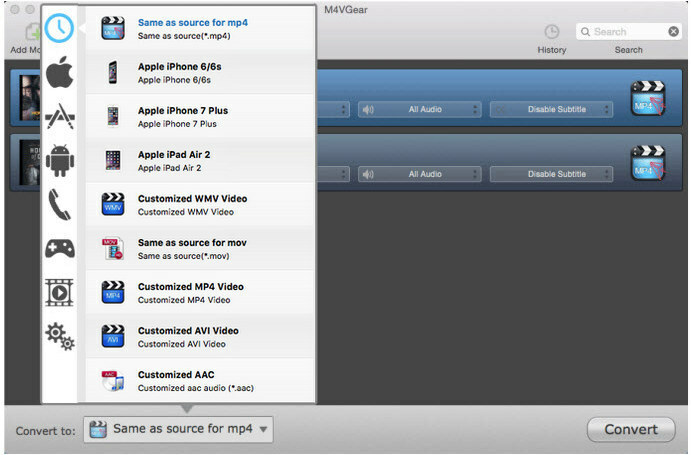 Note: M4VGear will offer you a 1-minute free trial which allows you convert one minute of iTunes M4V videos for free. You can purchase full version of M4VGear iTunes M4V to MP4 Converter with limited-time price $44.95 ($49.95) to remove the time restriction Now. If you are Apple Music subscriber and also want to enjoy Apple Music on MP3 players or other HD devices without restrictions. Sidify Apple Music Converter should be the best choice, which enables you to convert Apple Music tracks and iTunes M4P music to plain MP3, AAC, FLAC and WAV format losslessly at up to 20X speed, while keeping original audio quality and all the ID tags.